Koyi Mateil is the Opera Twilek seen in ROTS. 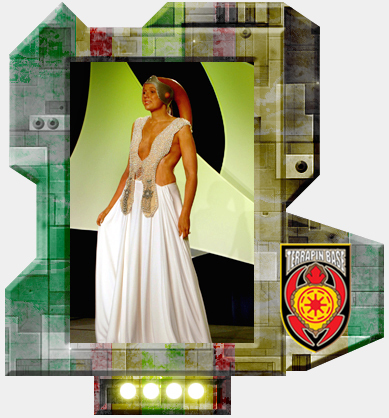 I started this costume in March 2006 with research and finished it in time for Celebration 4 in May 2007. There are about 7000 6mm sized beads and pearls on the bodice. Vintage pewter colored glass seed beads were used to make the stars on the front and also the stars on the shoes. I opted not to make the side panels on the bodice because I thought they took away from the elegant look of it, instead it was taped to my body. The Lekku were made by Pam's Twilek Creations out of Latex. The skirt is a jersey material that has a lot of swing and movement to it. 3 awards at one con! Count 'em up baby!